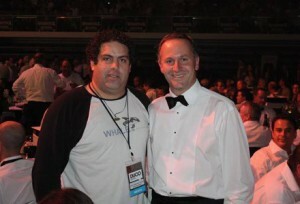 Cameron Slater (left), and John Key (right), presumably in his capacity as a kitchen sponge. Facing fresh criticism about the details of his relationship with Whale Oil blogger Cameron Slater, Prime Minister John Key today claimed that, on the occasions he spoke with Mr. Slater, he did not do so in his capacity as Prime Minister, nor leader of the National Party, nor even as a human being. “I think most New Zealanders would agree that, you know, if you find yourself at 11pm talking to a sponge, well, you’ve probably had a good night out, to be honest. Green Party cochlear leader Russel Norman sought to table a sponge, in relation to an apparently unrelated political point. The Prime Minister’s explanation evokes memories of when former Labour leader David Cunliffe earlier this year addressed the media not as himself, but as a liar.